A view from the East Pyne courtyard through the building's eastern arch. The arch has been named in honor of James Collins "Jimmy" Johnson. a former slave who sold snacks to students on Princeton's campus for more than 60 years. The renaming is part of the university's effort to recognize its ties to slavery and create a more diverse and inclusive campus. A local woman paid $500 for Johnson's freedom, and for more than 60 years he sold snacks to students on Princeton's campus. When he died in 1902, students and alumni paid for his gravestone, inscribed "the students [sic] friend." Princeton president Christopher Eisgruber plans to tell this fall's incoming class about Johnson during opening exercises in a few weeks. He'll also point out that beyond that archway lies a statue of John Witherspoon, one of nine Princeton presidents who owned slaves but one who also profoundly influenced the campus. In fact, one of Witherspoon's descendants purchased Johnson's freedom. Both steps exemplify new efforts at one of the nation's oldest elite universities to embrace and reveal its complicated past and become more welcoming to an increasingly diverse student body. "Having that archway in juxtaposition to this statue," said Eisgruber, "is a way of … having additional generations of students and visitors to the campus be confronted with the complexities of this institution …to push them to come to terms with it." Princeton president Christopher L. Eisgruber talks about the university’s efforts to become more inclusive. Princeton has also commissioned campus portraits of eight distinguished and diverse faculty and alumni; that is after naming a building for the writer and Nobel laureate Toni Morrison and a lecture hall in its public and international affairs school for Sir Arthur Lewis, the black economist, professor, and Nobel Prize winner. Others to be featured include Sonia Sotomayor, a 1976 alumna and the first U.S. Supreme Court justice of Hispanic descent; former administrator Ruth Simmons, who became the first black president of an Ivy League school (Brown); Carl A. Fields, the first black Ivy League dean; and Alan M. Turing, a 1938 graduate alumnus known as the father of computer science, who was persecuted for being gay. Around campus, multicultural artwork is going up on walls and in public spaces. Online historical tours will feature African Americans and women important to Princeton. And campus spaces are being named for former slaves intrinsic to the school's history. All this comes as the university opens its doors to triple the percentage of students from low-income families than it had more than a decade ago and strives to increase diversity. During the last school year, minorities from U.S. states accounted for 43.6 percent of the student body, up from 39 percent in 2012-13. Nationwide, colleges have been struggling with how to confront controversial aspects of their past, whether ties to slavery or former leaders who espoused racist views. A new portrait of Sir Arthur Lewis, a black economist and Nobel Prize winner who taught at Princeton, is displayed in the auditorium that now bears his name at the Woodrow Wilson School. The University of Pennsylvania in June said it would take steps to recognize that at least 75 of its earliest trustees had owned slaves. And Bryn Mawr College this week decided to leave the name of former president M. Carey Thomas etched on its library despite her racist views, but call the building something else in public materials, and strip her name from student awards. Some efforts at Princeton trace to 2014, when palpable anger flared on campus — as at other colleges — over the killing of Michael Brown, an 18-year-old unarmed black man in Ferguson, Mo., and the grand jury decision not to indict the white officer who shot him. Eisgruber, who had been president for about a year, began meeting with minority students who didn't feel included at Princeton. The president noticed his own discomfort one day when meeting with minority students in an iconic campus room. Its walls were adorned with portraits of people deemed important to Princeton's history: All were dead white men. "Oh my goodness," Eisgruber recalled thinking, "we're trying to send these students a signal that we want them to become part of this community, and we've just put them in a room that says exactly the opposite." Later that year he formed a task force of faculty, administrators, and students to make the campus more inclusive. In a report the following spring, the task force concluded Princeton's minority students had "a less positive experience" on campus than others. The Woodrow Wilson School’s Robertson Hall at Princeton University. Some students in 2015 demanded that Wilson’s name be stripped from the school, given his racist views. The university retained the name but promised better efforts on diversity. What followed was a controversial challenge to one of Princeton's most iconic leaders: Woodrow Wilson, who led the university for eight years and then the White House. In the decades since, critics have assailed Wilson's legacy, noting at Princeton he prevented black students from enrolling, and as U.S. president, he supported the resegregation of federal departments. In the fall of 2015, a coalition of students known as the Black Justice League demanded that Wilson's name be stripped from an undergraduate residential college and Princeton's renowned public and international affairs school. They staged a sit-in at Eisgruber's office. They put up racist Wilson quotes on campus and projected onto Robertson Hall — home to the Wilson school — The Birth of a Nation, the 1915 film that portrayed the Ku Klux Klan as heroic and one Wilson had screened at the White House. Some faculty issued a letter supporting students, noting that students of color "all too often find themselves on the margins of this University." A trustees committee in 2016 recommended that Wilson's name be retained but that his past be fully aired and that the university find ways to support diversity on campus. Senior Fernanda Fernandez recalled the angst on campus during the protests over the Woodrow Wilson name. The controversy "tore some friends and relationships apart," said Fernanda Fernandez, 21, a senior neuroscience major from Rutherford, N.J. "But I think in the end the fact that things like that were being discussed was a step forward." Many recent efforts, including renaming the arch, came as a result of that 2014 task force report and the trustees' recommendations on Wilson. "This is what happens when you bring diverse voices to a table," said Khristina Gonzalez, associate dean and director of programs for access and inclusion. James Collins “Jimmy” Johnson was a fugitive slave from Maryland who worked on the Princeton campus for more than 60 years, first as a janitor and then as a vendor of snacks that he sold from a wheelbarrow. He died in 1902. And some of it was only possible because of Princeton history professor Martha Sandweiss and her students. Last fall, they unveiled in-depth research on Princeton's ties to slavery and African Americans significant to the university's history, including Johnson, the former slave. The Princeton and Slavery Project unearthed hundreds of documents that looked at Princeton's historical ties to pre-Civil War Southern culture. The planned portraits of accomplished alumni and faculty represent the first additions to Princeton's portrait collection, outside of presidents and some deans, since the mid-19th century. A committee looked for subjects who had been influential over the last 75 years in their field, their service to the nation, or the culture of the campus, said Treby Williams, Princeton executive vice president. A garden outside Princeton's library is now named for Betsey Stockton, another former slave who worked in the home of a university president and later founded Princeton's first school for black children. And the university has commissioned artwork about Wilson's dual legacy to be displayed outside the school bearing his name. It will feature Wilson quotes, both admirable and awful. "It will do what universities should do: Start honest conversations about difficult topics," Eisgruber said. He supports the decision not to erase Wilson's name. "Whether you like him or hate him, if you're on this campus, you have to recognize that a lot of what's here is here because of what Woodrow Wilson did," said the president, a 1983 alumnus. "But I do think we have to speak honestly about Wilson himself and we have to be more complete about how we talk about the community." Princeton sophomore Daniel Benitez (left) said he wished the university had taken Woodrow Wilson’s name off the school. Daniel Benitez, 19, a sophomore from Green Bay, Wis., wishes the school had jettisoned Wilson's name. "Princeton is very quick to say, 'We're diverse now,' " he said. "But they are also very quick to protect their old ways, to sort of look past the ways they have discriminated against people in the past." Benitez and others in a summer program mainly for first-generation college students credited Princeton's efforts to become more inclusive. Still, they want more progress, especially in attitudes, and the elite student clubs. "When people talk about food stamps, they talk about it a step away," said Austin Colorite, 19, a sophomore from Rogers City, Mich. "It's a reality for me." Sophomore Austin Colorite said some members of the student body talked about food stamps one step removed. For him, they are a reality. Princeton in recent years has admitted more low-income students, as measured by those who receive federal Pell grants. Last fall, 22 percent of freshmen were Pell eligible, compared with 7 percent more than a decade ago, said Janet Lavin Rapelye, dean of admission. That was intentional. For years, the university's admissions and financial-aid offices had kept their deliberations separate, so students' ability to pay wouldn't impact whether they were accepted to the university. Now admissions officers know who is Pell grant eligible when they make their decisions. Also this spring, Princeton restarted a transfer program that had been dormant for decades, giving students from community colleges, lower-income families, or the military a path into Princeton. Nine will attend this fall. "Without the transfer program, it was just very clear to us that we were missing a whole cohort of students in this country," Rapelye said. 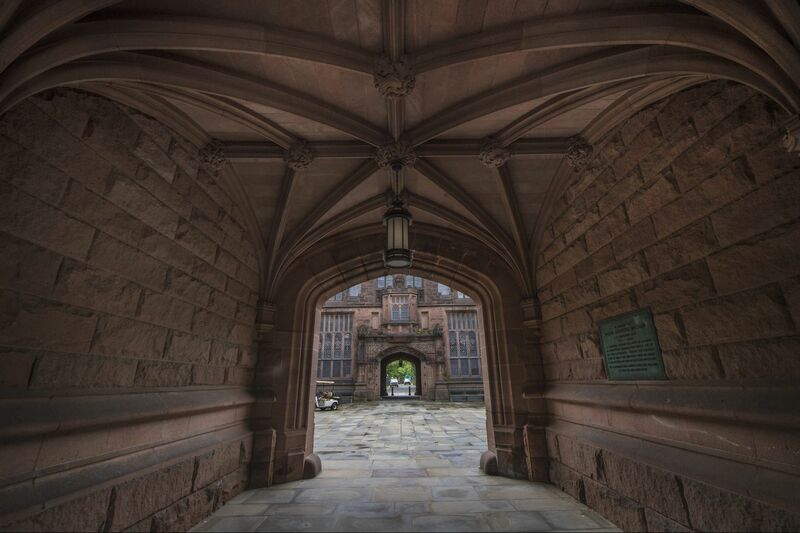 For a school among the nation's most selective — Princeton accepted only 5.5 percent of applicants last spring — the moves haven't gone unquestioned: If Princeton makes room for more low-income students, what about the middle class? What about high-caliber, affluent students? One step, Eisgruber explained, is to expand enrollment by 500 students, or nearly 10 percent. That plan is projected to start in five years, once housing is built. "If it were zero sum, it would be a very cruel set of choices," Eisgruber said. "It's not zero sum." In the meantime, all new students will learn about Princeton's history — starting with their procession beneath Jimmy Johnson's name as the semester begins.